Today’s guest post is a Q&A with Fleur Christacos. 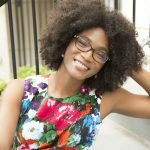 Fleur is the CEO, Founder, and Designer behind Fleur of England. For the last 17 years, Fleur has been designing bespoke embroideries, something which the brand is now famous for. Fleur is inspired by the beauty of her natural surroundings and how this can translate into modern femininity. 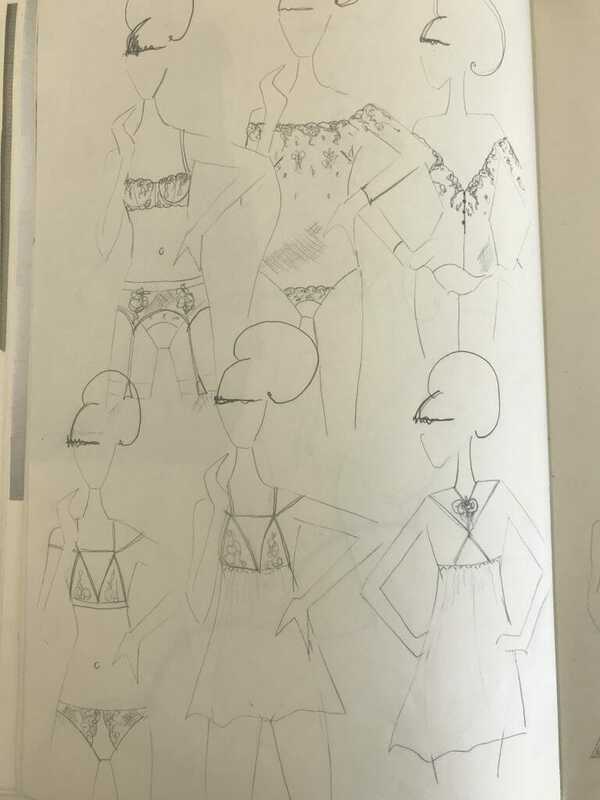 After graduating from university in Fashion Marketing, I decided I wanted to explore my love of lingerie and move into design. I was fortunate to work at a number of jobs which gave me the experience and knowledge needed to branch out on my own. In these jobs I was given the opportunity to visit couture embroidery houses in the Alps, where I learnt about traditional embroidery techniques and modern technology. This reignited my love of the art and taught me valuable lessons I later used when designing the intricate embroideries for Fleur of England. Why Create a Unique Embroidery? As the name and the designer behind Fleur of England, my vision has always remained the same - to create beautiful, feminine lingerie that fits. It is important to offer my loyal customers something bespoke and luxurious. Hand-designed embroidery adds something unique to every collection. I find that when designing, I often adapt the embroideries to fit with the different silhouettes of the collection. This hands-on approach to design and construction ensures every piece is exquisite, and I always try to encompass the idea of modern femininity in every piece. One of the most common questions we are asked when showing our collections is, "What is the difference between lace and embroidery?" 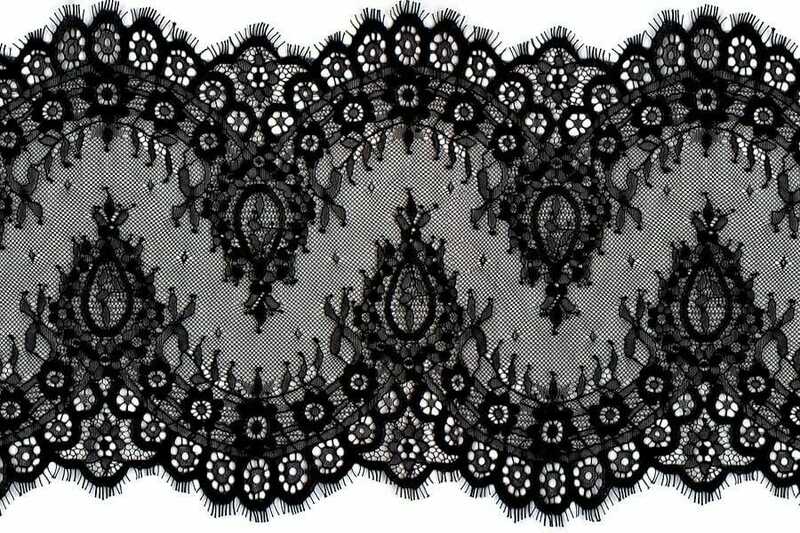 Lace is a fabric which creates a structure by looping and knotting threads in a chosen direction to create a pattern. This way of stitching means the lace does not need any fabric base to keep it stable. Embroidery is created by stitching a design onto fabric or other materials with a needle and thread. For our designs we use our signature invisible Italian tulle as the fabric foundation for the bespoke design to be stitched on. Throughout my collections, I use two types of embroidery: Guipure and normal embroidery stitched onto fabric. Guipure embroidery is created by stitching design onto a special fabric which, when washed, dissolves away to leave a beautiful motif. This can then be appliquéd onto fabric. This type of embroidery is what we use for our well-known appliquéd Boudoir Bras. 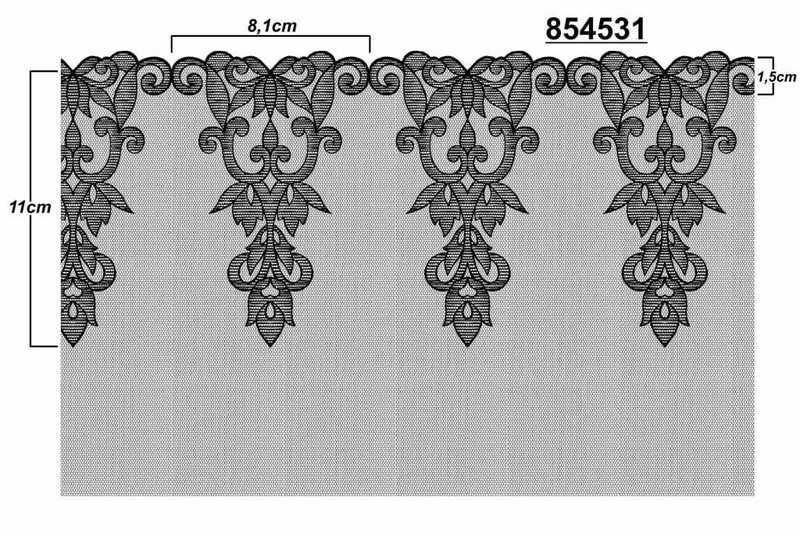 When designing normal embroidery, it is important to consider the repeat of the design and the width of the repeat. This type of embroidery is cut and stitched to create a garment so it is important to consider whether the embroidery runs along the edge of the fabric or not. Sometimes I design an edge and other times I design a band of fabric with two edges which is called a galloon. What is the Process for Designing Embroidery? My process of design always starts with a concept or a story to tell. I draw a lot of inspiration from the beauty of nature. Creating these bespoke embroideries allows me to have the freedom to design the silhouettes I want to. Designing embroideries allows me to continue my story telling of the collections: its concept, meaning, and emotion. My sketchbook is one of my most precious possessions. In it, I sketch all my designs and ideas for new collections and embroidery designs. 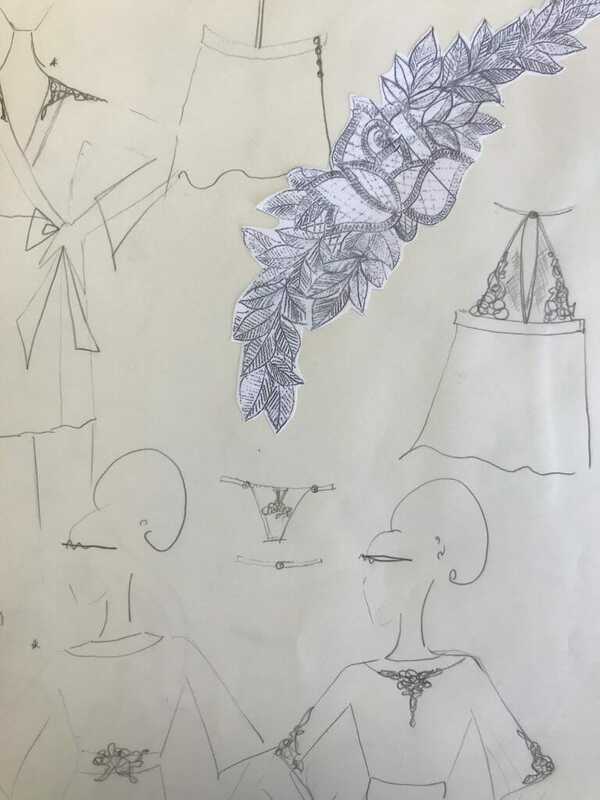 When I create a new collection, I look at where the embroidery will sit on the body and the design will usually evolve and change to best fit the silhouette. Technically, there are a few things I also need to consider when designing. First. 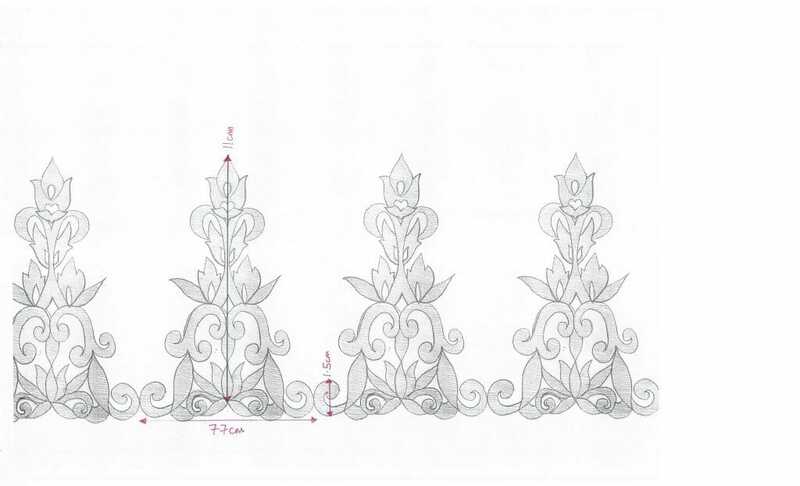 my design needs to have a certain size repeat, usually 5.4 cm (approximately 2.1 in) or 7.1 cm (approximately 2.8 in), so that it fits on the embroidery machine. I also need to think about my actual design and how it will translate into a stitched version. The edging, although delicate, needs to be practical and work for garments. Once the designed is finalised, my original sketch is sent to the embroidery factory to be made. They will then create a technical drawing from my design and send it back for approval. Usually something has to be tweaked and we mock up the embroidery designs in paper to check we are happy with them. After the sketches have been approved I decide whether the thread used should be matte or shiny, as this can change the whole feel of the embroidery, and spend hours selecting the correct colour. All of the embroidery is stitched onto Italian invisible tulle which is so delicate, it allows the embroidery to really stand out. Once the embroidery has been sent to the factory, their highly skilled team use modern programmes to create a technical drawing. Creation may take hours depending on the complexity of the design. This drawing is then sent back to us for approval. Once we have finalised the sketch the sampling can then be produced. This usually takes the factory around 3 or 4 weeks to get back to us. From initial designs to production, this process usually takes 6 months. How is the Embroidery Actually Made? Most modern embroidery machines are computer controlled and specifically engineered for embroidery. Industrial and commercial embroidery machines a have a hooping or framing system that holds the framed area of fabric taut under the sewing needle and moves it automatically to create a design from a pre-programmed digital embroidery pattern. The machines at our factory operate 24 hours a day! The reason embroidery takes so long to produce is the time it takes the set up the machines before the embroidery can be sewn. Multi-needle industrial machines are threaded prior to running the design. When the factory is ready to produce the embroidery, they load the final design file into the embroidery machine, making sure it is the correct format for the machine and that the stitched design will fit the fabric. From this they determine and mark the location of embroidery placement on the fabric to be embellished. To secure the fabric, they will need to use the appropriate stabilizer to keep it in place. This is then placed on the machine and they centre the needle over the starting point of the design. The process is ready to begin! Factory workers start and monitor the embroidery machine, watching for errors and issues. It is common to have a few defects in the production but these are highlighted as they go along. 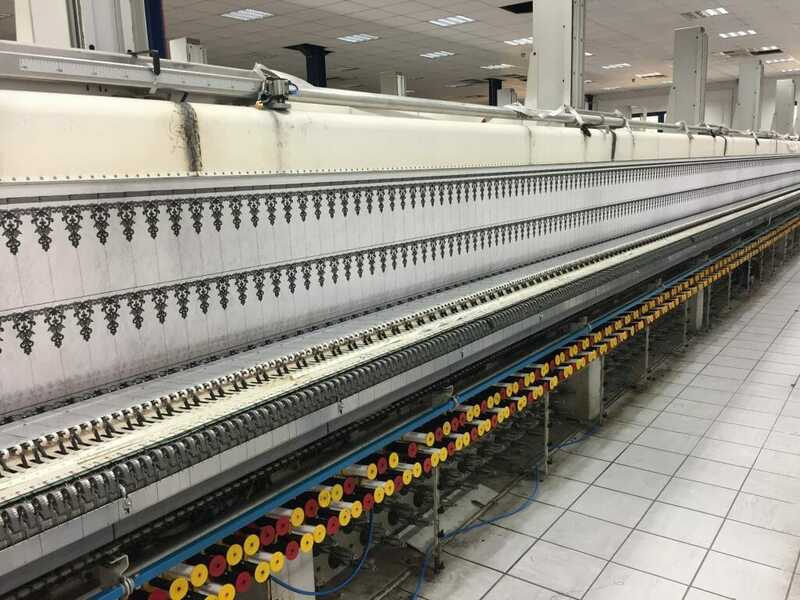 Once the process is complete, they remove the completed design from machine and separate the fabric from the hoop and hand trim the stabilizer and loose threads. We have to choose the width of our embroidery carefully as this determines the cost of production. For example, the fabric base we use is 135cm wide (approximately 53.1 in), and most embroiderery machines can repeat the design several times along the width. A multi-needle machine may consist of multiple sewing heads, each of which can sew the same design onto a separate garment concurrently. Such a machine might have 20 or more heads, each consisting of 15 or more needles. Because of this, we need to ensure our designs are the most economical when it comes to production. Our embroidery width is usually around 24cm (approximately 9.4 in) which means we are able to get around 5 repeats along the width of our base fabric. Once the embroidery has been produced over metres and metres of fabric, the factory uses a special cutting machine which enables the repeats of embroidery to be cut to the correct width. Why Design a Unique Embroidery? I love being so hands on with the whole design process, but my favourite part by far is designing the embroideries. As a luxury lingerie brand we like to constantly offer something new to our customer, and using unique materials, like our bespoke embroideries, really makes us stand out from our competitors. this is so effing COOL!!! thank you for showing this unique insight into how these are made!! I had absolutely no idea how big commercial embroidery machines were – my mind is blown!! !